Dip a 2 ½-inch angled paint brush into the desired color; dip only 1/3 of the way down the brush, tapping the color from the paint brush instead of brushing it off. Hit the corners and edges of your room with the angled paint brush, leaving about 2 inches (5.1 cm) of color around the edges. 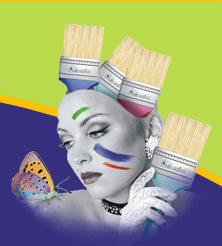 To cut in a straight line, press the tips of the paint brush bristles against the wall just enough to arch them but not enough to paint with the sides of the bristles. The slight pressure delivers the paint stored between the bristles to the tip of the paint brush and onto the wall.